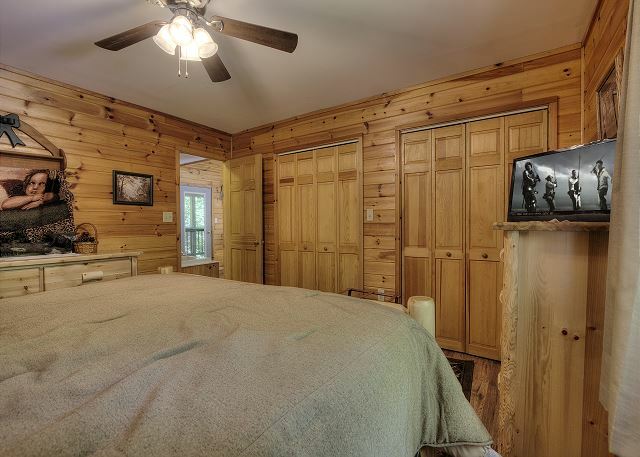 Beautiful log cabin with open floor plan that offers a gas fireplace, in-room jacuzzi, covered hot tub, & King bed in the loft. 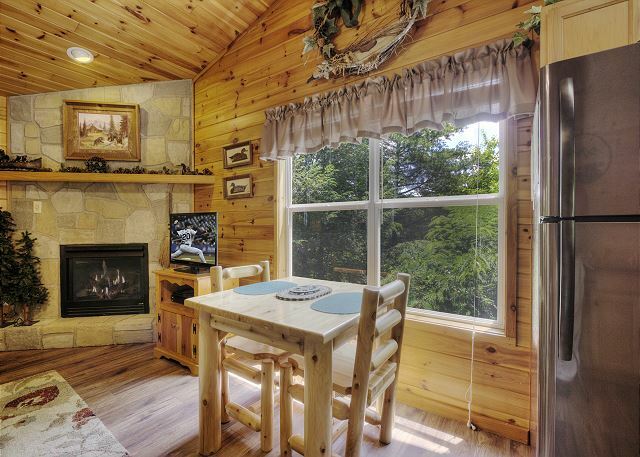 This log cabin... VIEW NOW. Looking for a secluded getaway? 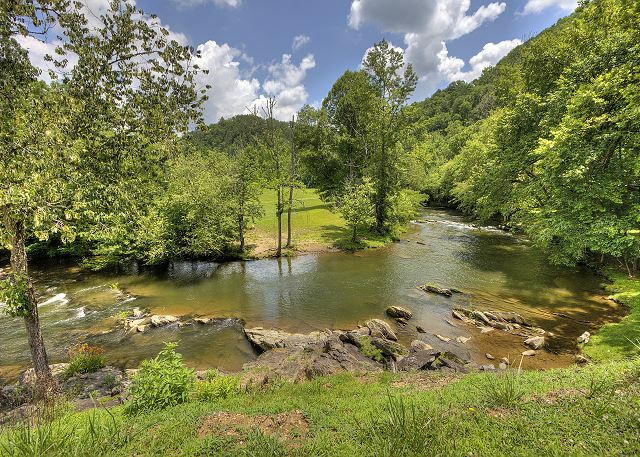 Let the sounds of the river soothe your soul, as you wash your worries away in “River Sounds” #121 Enjoy listening to the river from the hot tub on your deck as you gaze out over the ridgetop views of the mountains that surround you! 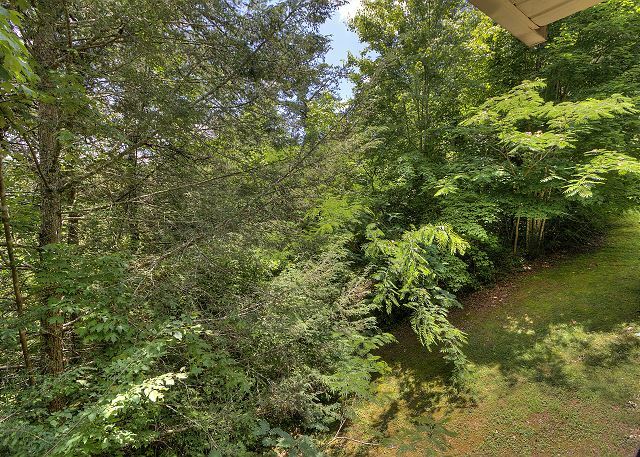 Located in the Gatlinburg Glades area, conveniently close to Dollywood & Splash Country, approximately 10 minutes from either Pigeon Forge or Gatlinburg. 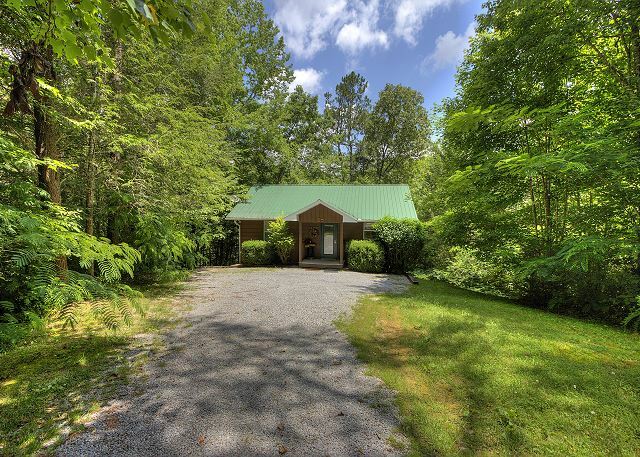 This cabin has paved roads all the way up to the gravel driveway. This property would be considered motorcycle friendly at the riders’ discretion. There are some There is comfortable parking available for up to 2 vehicles. 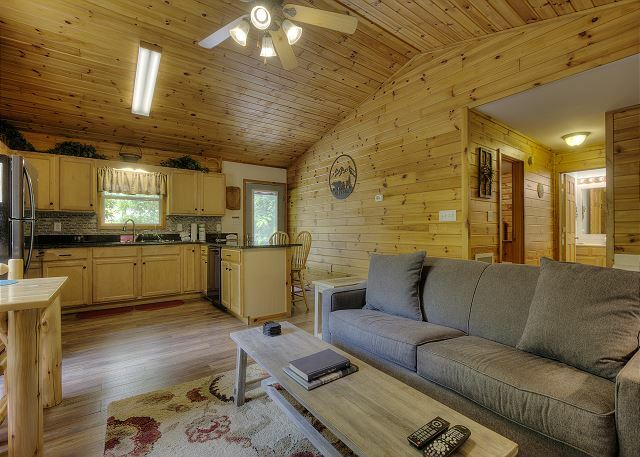 This 1 Bedroom, 1 Bath cabin that sleeps up to 4 is 1 level. There is 1 step to reach the cabin. 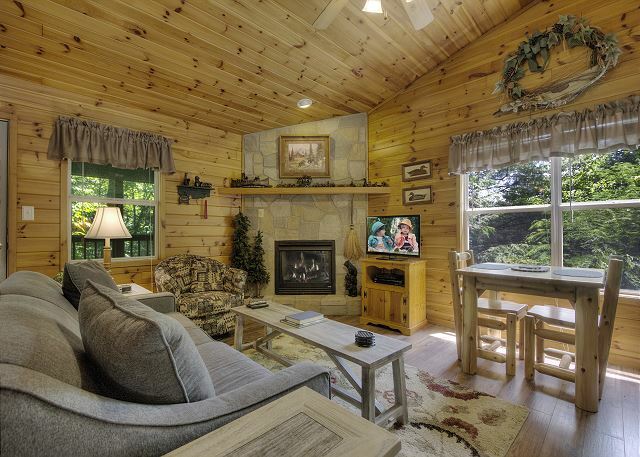 Upon entering this beautifully decorated cabin, you will find a fully equipped kitchen bar seating for 2, a living area with a Queen sleeper sofa, a stone gas fireplace, and flat screen TV. 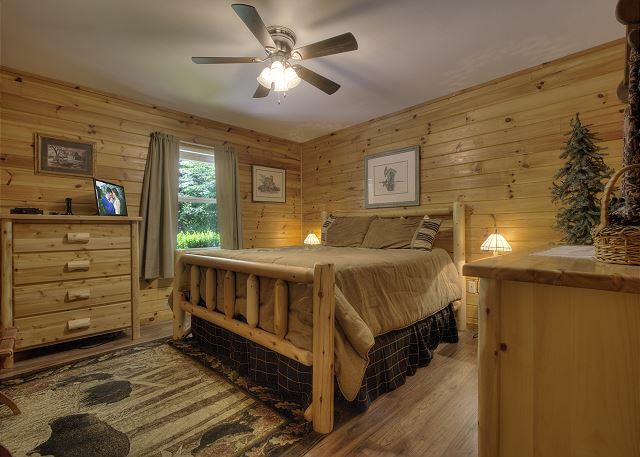 There is also a large King bedroom with a flat screen TV, and a bathroom with a shower tub combo. 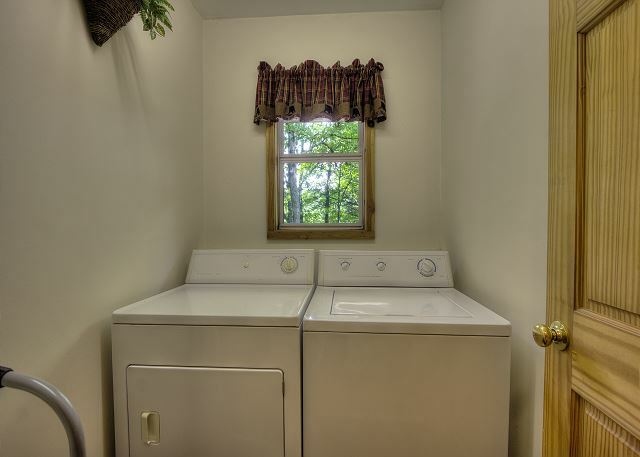 The washer & dryer are also located on this level. 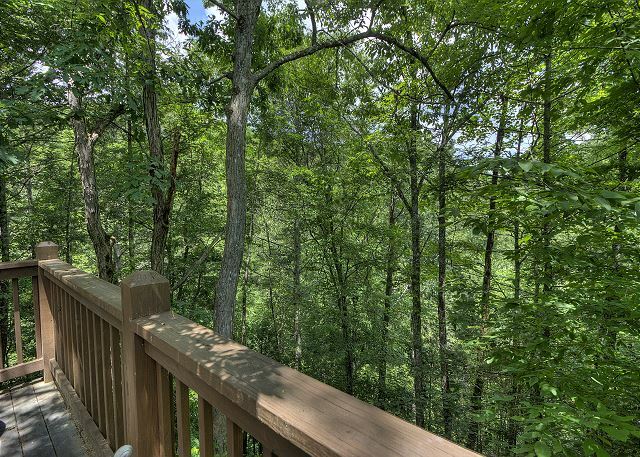 The deck holds the relaxing hot tub, charcoal grill, patio furniture, and offers both beautiful views surrounded by nature, and the peaceful sounds of the river below the property. 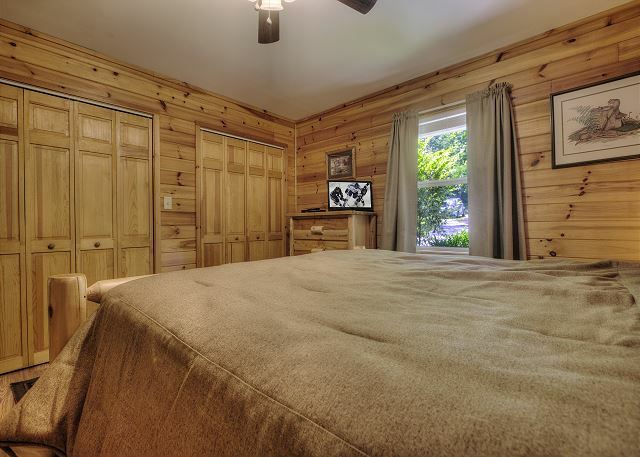 All your vacation dreams can come true in “River Sounds” Don't miss out --- Call us today to book this beautiful 1-bedroom retreat. Price is up to 2 adults. Each additional person is $12.50 nightly. (Kids under 12 are free) Must be 21 years or older to rent this property. No Smoking Please! 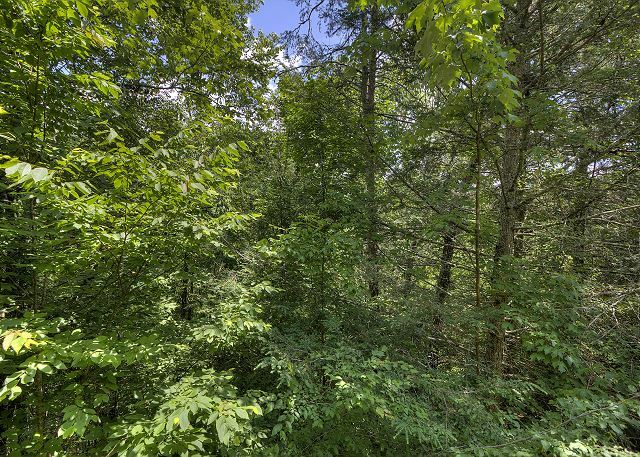 Nearby Attractions Great Smoky Mountains, Hiking, Fishing, Shopping, Ziplining, Horseback Riding, Tubing, Kayaking, Swimming, Waterfalls, Go Karts, Putt Putt, Laser Tag, Snow Skiing, Water Skiing, Trails, Amusement parks, Water parks, Fly fishing, Caves, Caverns, Outdoor activities. Sightseeing, Family fun. There was a small river nearby. You can hear the sound but you can’t see it clearly. It’s on the other side of road. Network is bad in the area. And there is no wifi. That’s the trade off we did for the place. Otherwise it’s great. The cabin was the perfect size for my husband, baby, and me. We enjoyed our stay. It was very clean, and you can hear the river from the back porch. It was agood overall stay. The location was nice, however, it was at least a 15 minute drive for most convenience items. The cabin was very, very nice and everything is as nice as the pictures online. I would like to see if internet could be brought in and maybe a couple of hooks in the bathroom but everything else was just great! Wonderful cabin with lots of privacy. 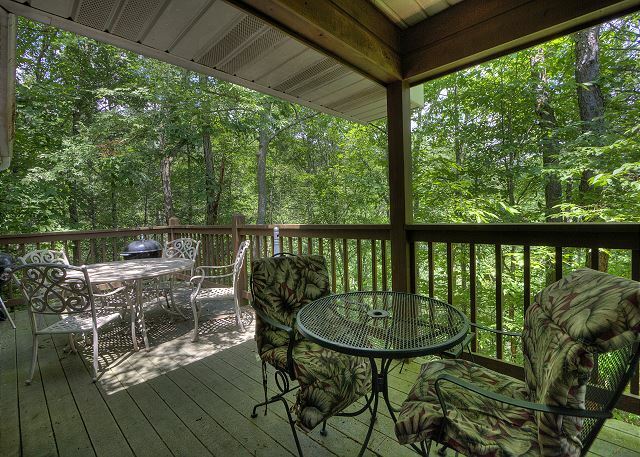 Back deck surrounded by trees. 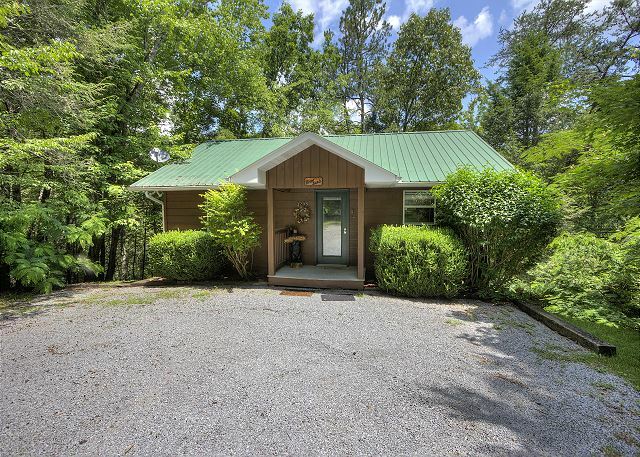 Very clean and charming cabin with updated amenities. Definitely make a return visit ! Check-in was easy and the management company very professional. Overall, we enjoyed our stay; beautiful remote area that really allows you to relax. There are a few things that need attended to and we called the management office to let them know. Overall, the cabin was clean and ready for us when we checked in and we enjoyed our stay. Would definitely recommend, but perhaps not during cold months as the doors and windows are drafty. Very peaceful and serene. Back to nature wonderful clean river flowing. 24/7 my wife an I had a awesome time away from the hustle and bustle of everyday life. It was truly beautiful being surrounded by nothing but nature. And everything you needed was right there for you!!! This was the 1st time I had ever been to a cabin everything was perfect. Everything was exactly as described it was very clean and the staff at check in were very friendly. I will definitely rent from them again. Thank you for making our 23rd Anniversary an amazing experience! It was a very quiet, restful place to stay. The cabin was beautiful and well-equipped. We loved the hot tub on the deck and the jacuzzi. Our rental was the perfect size for my girlfriend and I. It was very clean and secluded. It’s not to far from the cities and attractions, but it’s far away enough to relax and enjoy each other’s company. My wife and I wanted to getaway for a couple of days and this place was the perfect place to go. Very clean and very private. If your looking to relax this is your place. Loved this cabin, we will reserve this one again. We have booked with Aunt Bugs several times over the years and we are never disappointed. 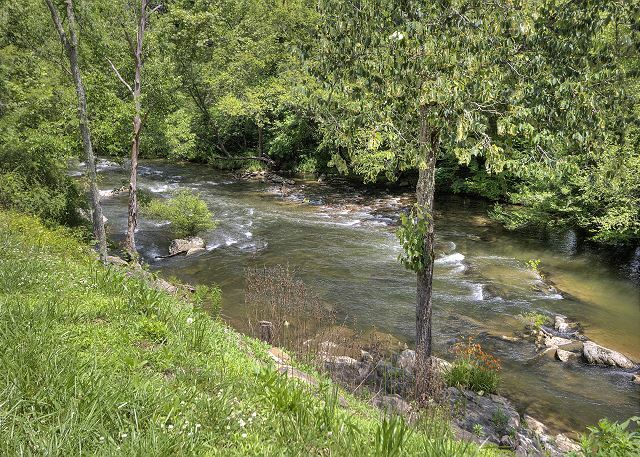 You truly hear "River Sounds" while sitting on the back deck. 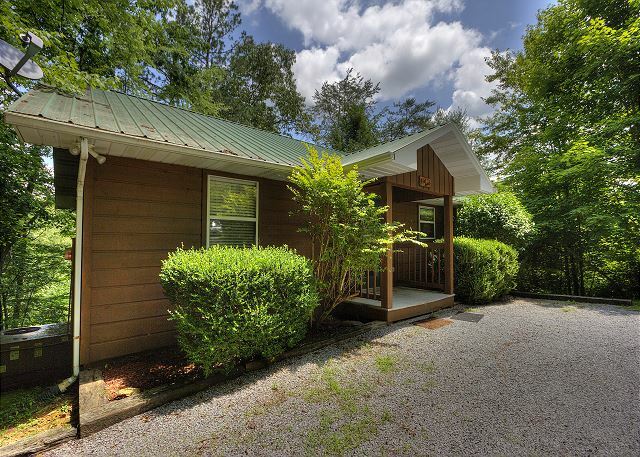 This cabin is perfect for 2 and in a great location, easy to Gatlinburg and Pigeon Forge. Will definitely return to this cabin the next chance we get. This cabin was super cute and cozy. It was very clean and welcoming. I would definitely want to stay there again next time I’m in town. It was a cozy,beautiful cabin. Just the right size for us. 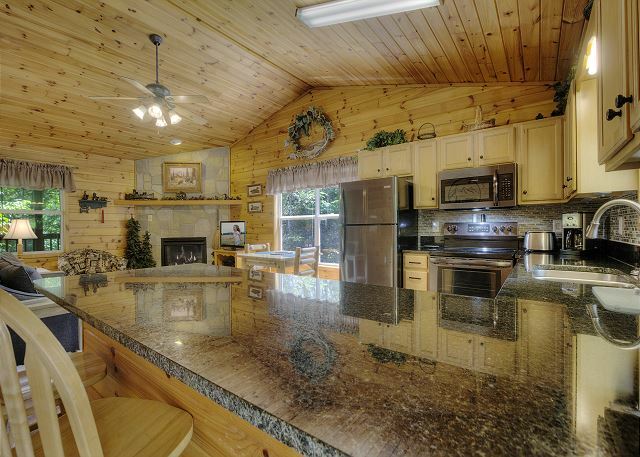 Book-sized kitchen, big whirlpool tub in the living area, so you could see the fireplace and t.v. The bed was Super comfortable. All amenities were there, such as paper towels, toilet paper, iron and ironing board, but no hair dryer. We had a wonderful 3 day stay. We called the office to let them know we were stuck in traffic and they let us know several guests had called for the same reason. The staff kept the office open an extra 2 hours and we we checked in as graciously as if we were there at 4. 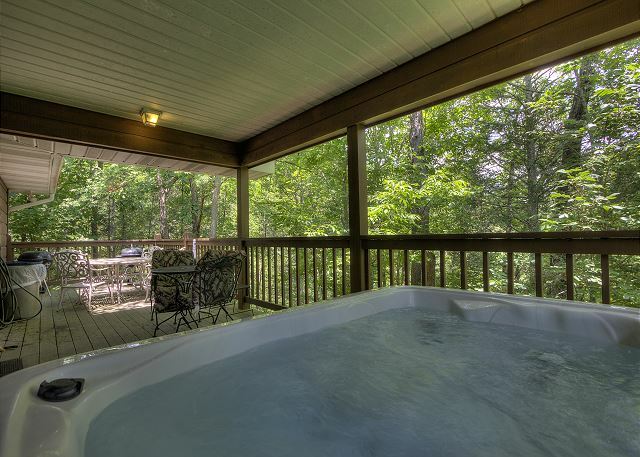 The hot tub was already warm and the cabin was fresh and clean. The river was so beautiful to listen to from the deck and gorgeous to watch from a little strip near the road. We even had a racoon great us the first night! Will definitely be back. We were in the area to visit friends and stumbled on this rental. When checking in the staff was friendly and knowledgeable. Once we got to the cabin, we were pleasantly surprised. It was great for the 2 of us to kick back and relax. The cabin was overall clean and the bed comfy. Only 1 downfall we noted is the hot tub did not have sanitizer in the float and I did not find any reserves but other then that, I would recommend this one to anyone and will be back!! Cabin very nice and clean. Our cabin was exactly as described. Still decorated for Christmas and that was a PLUS! Check in was easy and directions to the cabin were perfect. We were disappointed that the water heater wasn't big enough to heat the indoor soaking tub. And if there had been some "Dawn", I could have cleaned up the few dishes we used instead of running the dishwasher. We felt the extra charges (reservation fee and cleaning fee) were a little high and we didn't expect those until we had already made the reservation. We had a great time. The cabin was very clean and nice. 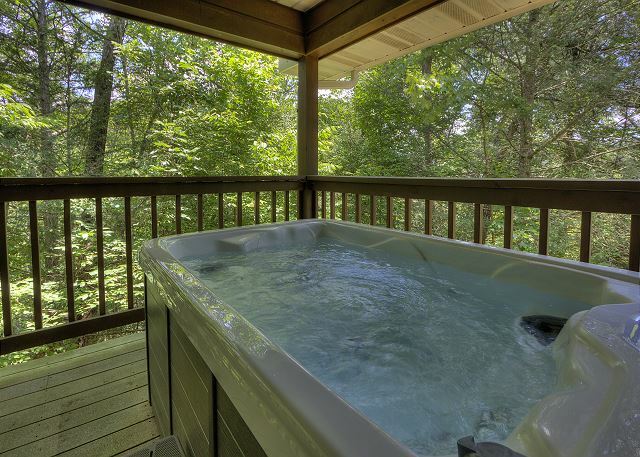 The hot tub was so enjoyable and located just out the back door on the deck. You could hear the river as the water flowed close by. I highly recommend this location to anyone looking for a quiet loacation to have some private time with your better half. 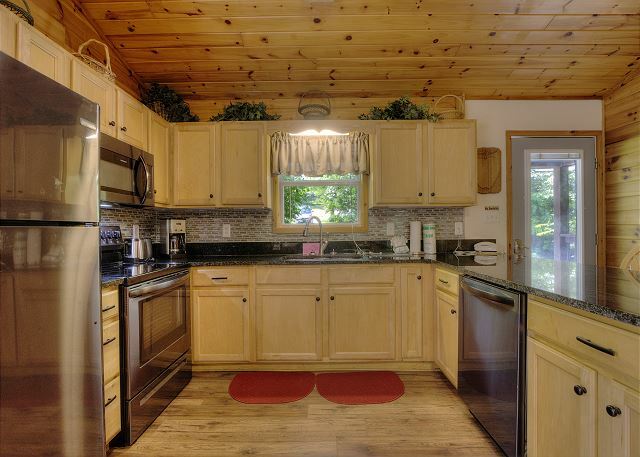 When we got there the cabin was super clean, the staff were all very friendly and helpful. It was a great place to stay away from the hustle and bustle. Very quiet and relaxing. Enjoyed every minute we were there. 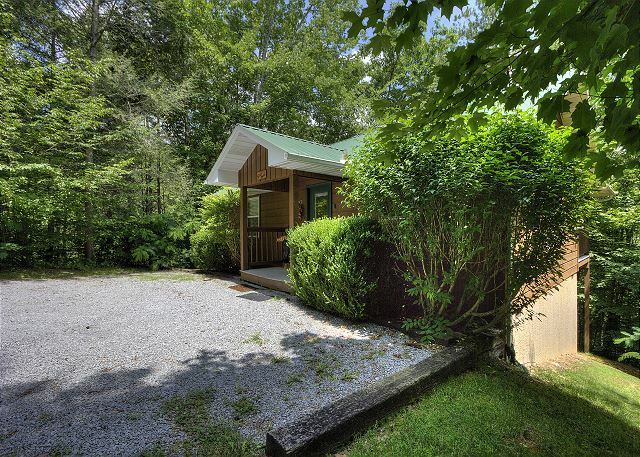 I will always want to rent this little cabin when we come back. The cabin was very nice. It was clean and was close to the strip in Pigeon Forge. 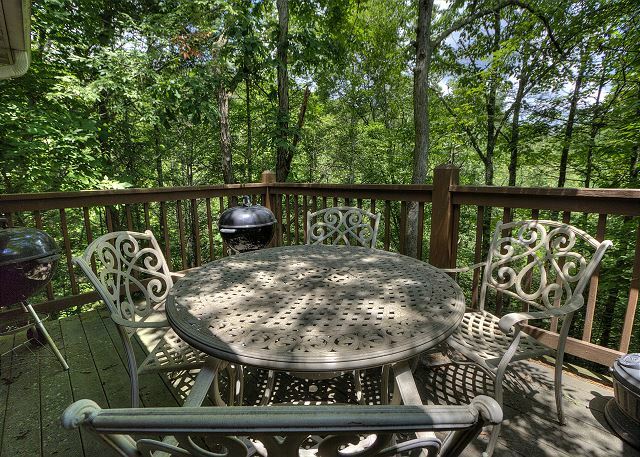 The back deck where the outdoor hot tub is located is very secluded. Peaceful,calming. Enjoyed our stay wish we could have stayed longer. OVERALL THE STAY WAS NICE. ONLY A COUPLE OF THINGS WERE WRONG. UPON ENTERING THE CABIN IT HAD A ORDER BUT WENT AWAY AFTER STAYING IN IT. WE BOUGHT SOME AIR FRESHNER TO USE.THE CABIN ITSELF WAS VERY NICE. LOVED THE LOCATION. SITTING ON THE DECK LISTENING TO THE RIVER WAS VERY PEACEFUL. RELAXING. WOULD STAY AGAIN. NEXT TIME WILL STAY WHEN WEATHER IS BETTER. WE STAYED WHEN THE WINTER WEATHER WAS GETTING BAD. OVERALL THOUGH IT WAS A GREAT PLACE. RECOMMEND PUTTING AIR FRESHNERS IN THERE. THE PROPERTY WAS JUST AS IT APPEARED IN THE DESCRIPTION. VERY COZY. The cabin was great. Very clean and away from everything. Exceeded our expectations. Cabin was just as it was presented, was private and cozy! We will be back! This place was so peaceful, all troubles just melt away. We arrived on a Friday checked into our cabin. Very nice people to deal with at aunt bug's. Our cabin was clean and very nice. You could hear the river while sitting on back deck. Inside our cabin was nice to. 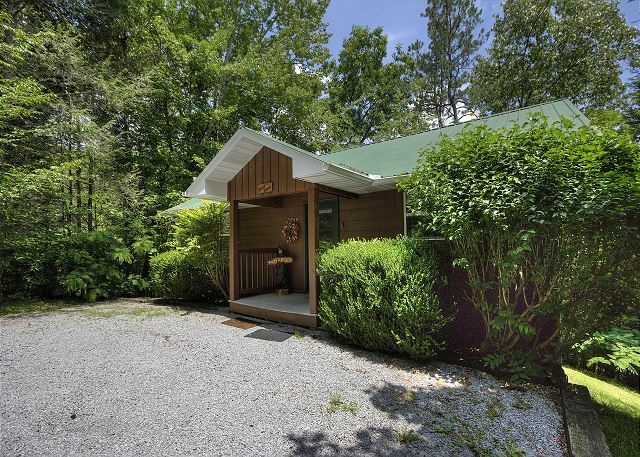 The cabin wasn't far from pigeon forge and dolly wood. We will definitely be back! After going through chemo for the past 6 months we were looking to get away and relax. Evryone at Aunt Bugs was so nice and helpful. The cabin was just what we had wanted. It was beautifully decorated and the sound of the river was so soothing. We will definitely rent this cabin again!! Thank you Aunt Bugs for a wonderful and memorable experience!! Had a great time, cbin was clean and quiet neighbor, weather was great praise our HEAVENLY FATHER for all HIS benefit. The cabin was great! The cabin was clean and well done. We had great customer service and we loved the area. We will definitely come back. We would recommend this property to our friends. It was our 20th anniversary get away. It was nice and quite. Secluded enough where nobody bothers you. There were 3 small minor issues, grill needs updated, as it was rusted, weak WiFi and cell phone reception (not a deal breaker at ALL! ), and small issue with the furnace. Otherwise, it was GREAT! We'll be back. We are the first time visit smokey mountain. Before we come we already know that March was not the besy season.But we still had a wonderful vacation,mostly because the place we stay. It is inside the woods, close the rever, large space, beautiful house. With every kitchen needs. Give us a very relax place. Unforgettable place in my life. I give 5 for the cabin. I have to admit, I was a little afraid of what might await me when we arrived after reading some of the reviews, however, I had already booked the cabin and it was way to late to back out now. We arrived to Aunt Bugs office to check in early afternoon. The staff was friendly, prompt, and very fast, wish every time we check in to a hotel it was that smooth and efficient! Directions to the cabin were right on. Arriving at the cabin we were greeted with a sight that was very comforting, it was exactly as the pictures showed! The cabin was clean and well maintained except for the rain gutters on the roof that were full of debris and overflowed onto the deck when it rained hard, the shower drain was a little slow, and a couple of miscellaneous spider webs way up in the corner of the ceiling. Not a big deal however, it is a cabin in the woods! No bugs, mice, etc that were mentioned in some reviews of different properties. No rashes from the hot tub either. Bed was made with perfect hospital corners, so tight you could bounce a coin off the bed. The bed was comfy and clean as well. Definitely would recommend this property to anyone. Very peaceful and quiet location, and yes it lives up to it's name "River Sounds". Thanks Aunt Bugs for a great vacation! Property was exactly as described. I would definitely stay again! Cabin was just as described. Water is soft which makes the tub/shower very slippery. 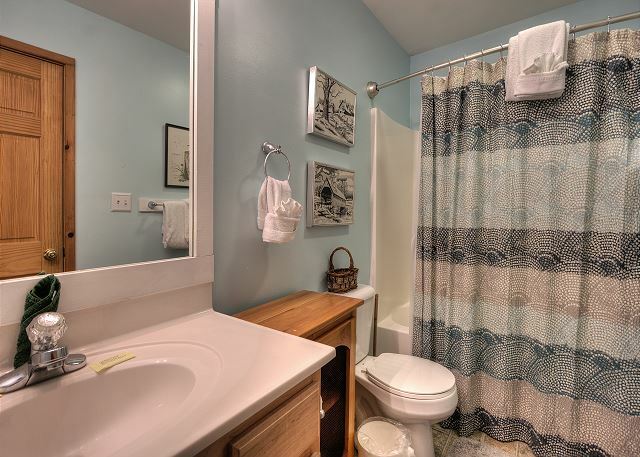 There is a tub mat under the bathroom sink however, I think they should lay it across the tub and not under the sink. Staff at check in was very nice and polite. Highly recommend this cabin. Loved the River Sounds cabin. It was just perfect for two people and very romantic and secluded. We didn't want to leave and can't wait to go back! 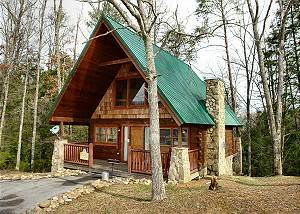 Th cabin was perfect for my wife and myself, very assesible, quiet, clean, just a great getaway. the rental experience was very simple easy and not complicated to set up. everything was great, and we are planing to do it again. Did have a problem with the tv ,but they went and replced it right away. also need to leave a note about the dishwasher I would not turn my own on at home a leave ,but you seem to want that done. We did have a great stay with your cabin. My husband is a huge outdoorsman and was pleasantly surprised by the location of our cabin. 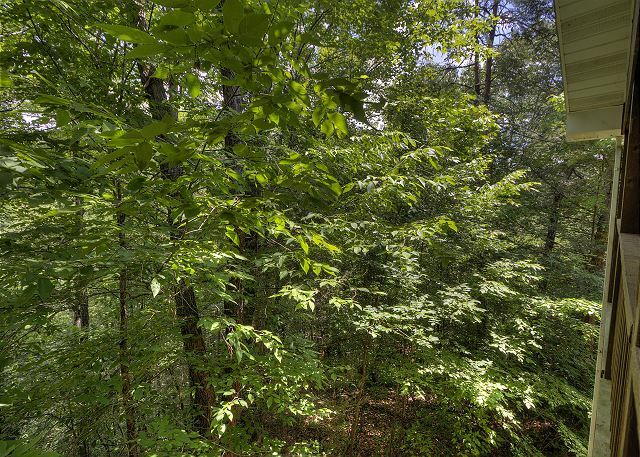 The privacy and woods surrounding the cabin were great. We can't wait to return!! We were looking for a place for a long weekend that was not in the middle of all of the hustle and bustle. Having a pet friendly location is also important to us. 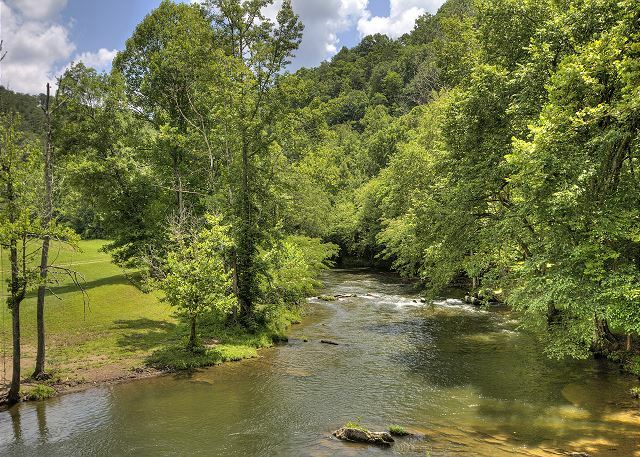 River sounds was far enough out of town to be quite and remote, but not so far that if you wanted to go to Dollywood or Pigeon Forge. It was a great place for a battery recharge and quite time together. Enjoyed the peace and sounds of the river on the deck. Close enough to the attractions but far enough away to not hear the noise of the city. Will defiantly return soon. Our cabin was absolutely wonderful..clean and very well kept. The only changes I would make are these: there needs to be a step up to the front porch (maybe just some stepping stones). The porch is too high for one step for people with bad knees. The other is there needs to be a step up to the hot tub. Short people are really at a disadvantage trying to get in. But we hated to leave. It was soooo peaceful and beautiful. The cabin was in a good location, well maintained and clean. Overall stay was good. Loved our cabin it was quiet for some down time that we needed at the time. I agree with one review that the front step need a rail or another step across ... your hands are full going in and some extra safety would have helped the bad knees. Could have used a cookie sheet type pan in there...didn't think to bring one. It was a very nice cabin.only problem was with hot tub. Could not turn the temp up on it and the directions on how to were not accurate. Other than that a beautiful cabin and experience. It was our first time there and can't wait to go back. Everything we needed was available, and the cabin was very clean. We really enjoyed our stay. The cabin was wonderful. My only negative was that when I went horseback riding they told me I needed my check in package from Aunt Bugs which I did everything over the phone and internet so didn't have. The girl at ranch told me to go get my package and she would refund me my money also Aunt Bugs would give me a bag with all discounts and free stuff. That was a lie. The girl only gave me an empty envelope which hurt my feelings. I spent all this money and that's all the thanks I get. Next question I would still recommend this place to my friends but I would tell them to be sure to go personally and check in. The cabin was immaculate. Homey. Good location. Nothing you could do about the rain and mosquitos. But everything was fabulous. Would like to suggest a new DVD player. Knowing we had no wi-fi we brought movies. It rained for the whole 4 days we were there. We had blue-ray dvd's which could not play in their machine. That was the worst of it. I'd recommend Aunt Bug's services and the River Sounds cabin anytime. The cabin was wonderful. My only complaint would be that the location needs an internet / WiFi connection. We knew upon booking that it didn’t but we anticipated having cell phone reception to help us book and plan our day around local attractions. Unfortunately, our AT&T carrier has zero coverage in that area. Cabin was clean, beautifully furnished, and comfortable. We really enjoyed the hot tub, jacuzzi, and the deck. The overall stay at 121 River Sounds Cabin was amazing, clean, quiet and relaxing. Our cabin was clean and exactly as described. I would definitely recommend this place to anyone. The cabin was very warm and cozy. The location was exactly what we wanted. 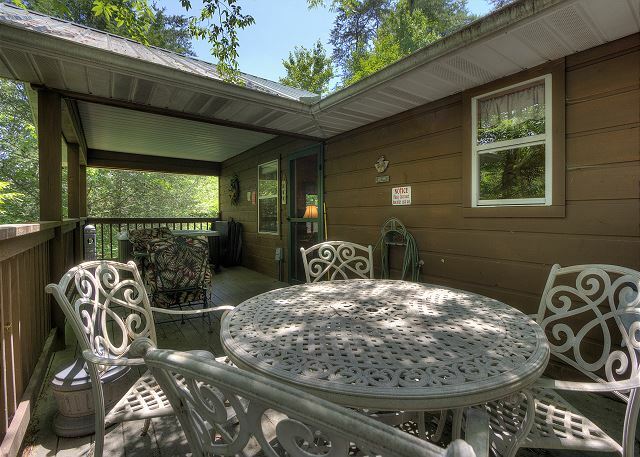 Very peasant stay - clean, nice cabin in a great location. Amazing best cabin rental around don't bother looking anywhere else. The cabin was beautiful. You selected a great cabin for us. It was very secluded which is what I wanted. 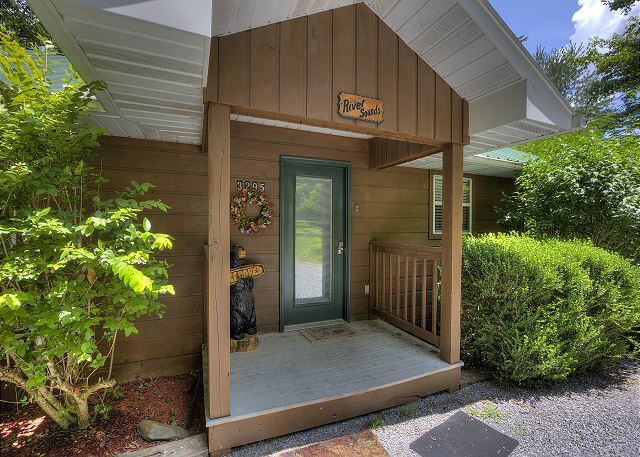 We were very relaxed for all of our stay and would stay at the same cabin again and I have already recommended it to several couples if they want to vacation in the smokies. The cabin was super cute, clean, and cozy. It felt very welcoming. I loved everything about it and would definitely stay there again. 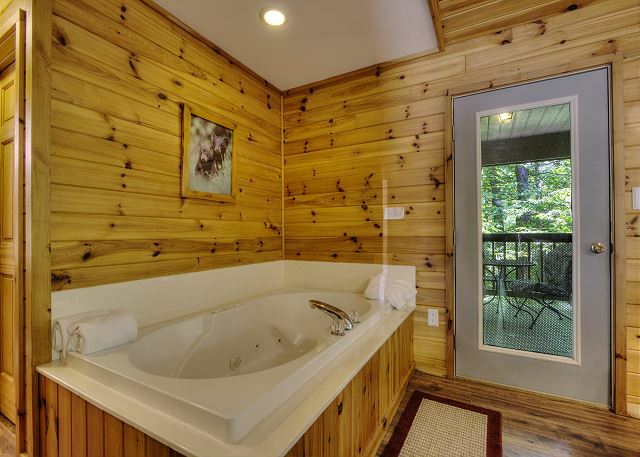 The only thing that disappointed us was that there wasn't enough hot water to enjoy the indoor soaking tub. We loved that is was still decorated for Christmas. Everything was clean and VERY comfortable. Thank you for a wonderful experience. our stay was peaceful and quiet. can't wait to come back. Aunt Bug's was knowledgeable and kind. thanks again for a wonderful week. Bill. The cabin was amazing and much more than we had hoped. The hot tub was an added plus and we have realized that we need more time to see everything while there so next time the stay will be longer. The cabin was exactly what we expected. Loved our stay! The cabin was "as described", clean, roomy and pleasant. Check in & check out was easy. Very pleasant experience. The hot tub in Riversounds never got hot. Warm at best. That was a big disappointment. The jacuzzi is a big part of the fun. When I called the office, I wasnt given a solution. I may have missed this when we booked this cabin, but it didnt have wifi. Wifi is so common it didnt occur to us to look for that amenity. When your cell phones dont work and you have no internet access, its changes our wntwrtainment options and the simple tasks we do hourly, daily. The extra blankets had a stale odor. The land line phone rang all weekend. Mostly sales calls and some very late at night. We loved the decor. The home is lovely. I would not have booked it knowing the wifi was not available. Overall it was a nice stay, but these small nagging issues made it way less successful than it could have been. Thats very disappointing. Cabin was clean and in the perfect setting. Staff is always great. Hope to book again soon! Everything was perfect we really enjoyed our stay and plan to be back very soon and want the same cabin! Everything we could think of for the kitchen was provided. We rented it for a 4 day Honeymoon and ABSOLUTELY loved the peace and solitude. My husband wants to make it a yearly trip and we really can not wait to go back. Wonderful location. Very clean. Had a perfect time! Thank you! Cabin was nice and clean and ready. It did have a weird smell that never really went away and the refrigerator was VERY loud running! Very easy to work with. Great late arrival check-in and easy check out! perfect stay. I'll be back to stay at River sounds again. 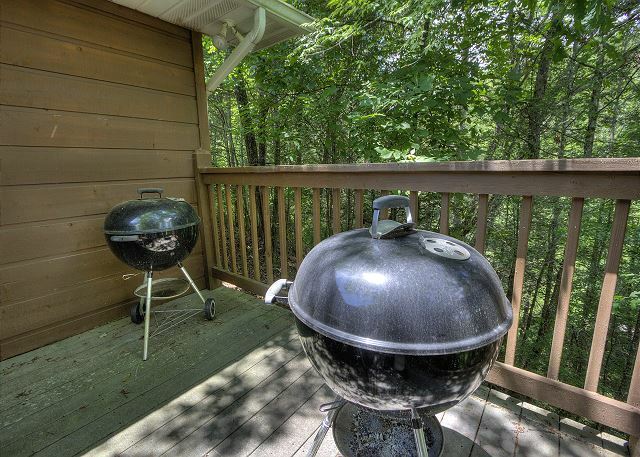 Enjoyed secluded area and very clean neat cabin . First time to ever stay in a cabin ! Would stay there again . Easy access to all places of interest . Cabin was very nice. Your staff was very friendly. We would book a cabin with you again. Check in was very smooth and very pleasant. Answered our questions and very helpful. Cabin was very nice, clean and just as described. My review is actually for 4.5 stars. Excellent vacation,first I've had in 24 years since honeymoon. Cabin was clean, even for my picky standards. Just needed a bit of maintenance and it would be 5 stars. Rain gutters over deck are full of debris and rain overflows onto deck along with debris. I will definately rent from you again when I come back! Thanks so much! Staff was super friendly, cabin very nice and clean. Very peaceful, loved hearing the river while sitting outside!!! We had a great time. There was an odd smell in the cabin, maybe sulfur in the water??? I'm not sure after a well it was easy to overlook. The cabin was clean and the staff was great. Will definitely use your services again. I have stayed many times at Aunt Bugs Cabins, have always had a good experience. the staff are always friendly and efficient. You did good. I will be using your company again. About the only thing negative I can say was I had to go to office to check out because phones were busy. Great place to stay. Cabins are always clean. Well stay again. Everything was very smooth. Great experience. Beautiful place. Will stay again. The cabin was so beautiful and cozy and perfect!! I would recommend providing cookie sheets and pot holders. And dusting the walls. 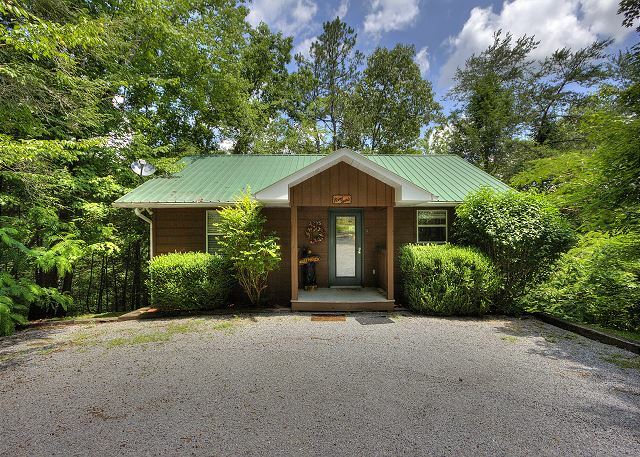 We were very pleased with our cabin, it was quite homey and secluded but yet close enough to Pigeon Forge, Gatlinburg, and Sevierville, which made it easy for us to see everything we wanted to see and do. Enjoyed our stay. Very pleasant. Relaxing. 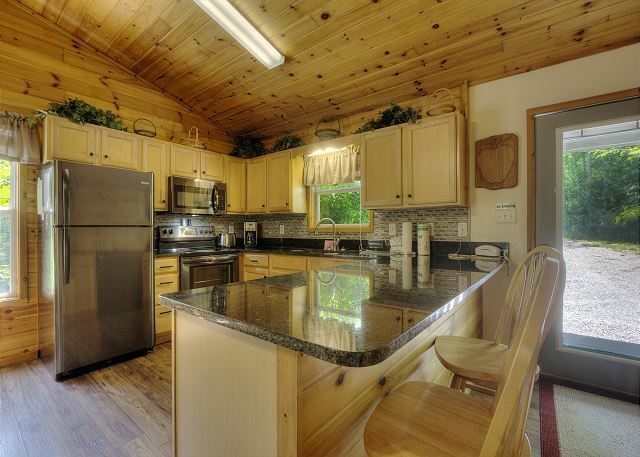 Very nice cabin and well maintained. Cabin was wonderful, clean, perfect gateway, secluded. ...just wonderful. Office staff was the best. It was a Great cabin. Clean and well stocked. Wonderful view with the surrounding woods and the souls of the river. The only thing is that there was a musty small but a candle took care of it and new pillows are needed. Loved the four days we were there. Great weekend!! It was a great time as a romantic get away. We enjoyed our cabin and the amenities that the cabin had to offer. I would highly recommend renting from Aunt Bugs. We enjoyed the things that the town's had to offer to. You will not be disappointed! We will be back! We had a nice time and didn't want to leave. Everyone was very nice and even called us to check on everything. The property is for Sale and we may be interested!! 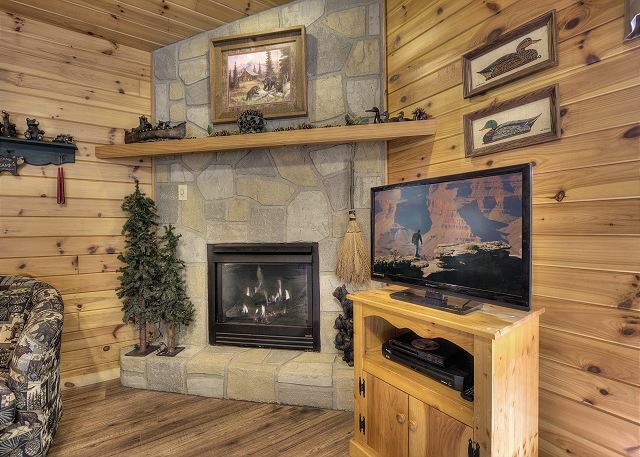 Everything was just as presented online and was very clean for a mountain cabin! The only thing is the chairs on deck need to be repaired/replaced. Two of them were broken. The cabin was great. Will be back for sure in the future. We have stayed at many other cabins over the years and this was our best cabin experience so far. The cabin offered everything I was wanting as far as location,hot tube,and sound of the river.i would highly recommend it. The cabin was clean nice and felt like home. Very nice cabin, quiet, relaxing, and a pleasant 23rd anniversary. staff very friendly & efficient. cabin very clean have stated there before and will likely stay again. The cabin completely met our expectations, with the exception of the musky smell. I guess that's just par for the cabin experience course, but air neutralizers may have helped some. Customer service was great. We would definitely visit Aunt Bug's in the future. we love the cabin very quite the only thing i didn't like it needs to have some kind of step to the hot tub. Loved the cabin. It was very clean and in a good location. We loved our stay. Everything was clean and beautiful. People were friendly and helpful.